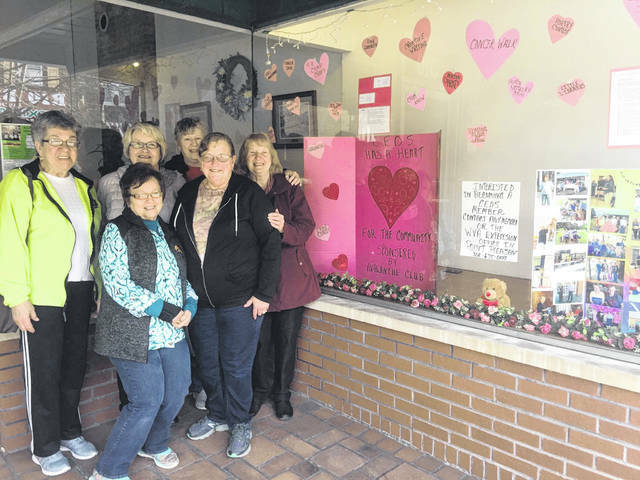 Pictured are Avalanche CEOS Club members Yvonne Fetty, Patty Johnson, Sue Darst, Eleanor Hoffman, Anne Byus, and Susan Paulson after decorating the Point Pleasant Register’s window. POINT PLEASANT — At times, little ones just need a little extra comfort. For several years, members of the Avalanche CEOS (Community Educational Outreach Service) Club made tokens of comfort for the youth and donated them to the Mason County Health Department and Pleasant Valley Hospital (PVH). Yvonne Fetty, vice president, shared throughout the year the club is involved with several community service projects. The members enjoy crafting together and felt making homemade items for local organizations would be a good way to give back to their community. For the health department, the members crafted teddy bears called boo-bears to be given to children after they had received an immunization to take home with them and for PVH the members made “Linus blankets” for newborn and sick children at the hospital to comfort them and for them to take home. Fetty explained to make the boo-bears the members cut out a teddy bear pattern, stuffed them with cotton, and sewed them together. After the structure of the boo-bear was complete, the members added buttons to them and gave them faces. The Linus blankets are made similarly to quilts, however, they are much thinner like a comforter. The front and back piece of the Linus blanket are separately designed and then the pieces are tied together with no stuffing in the center. “When we get together to make these items, we have a good time,” said Fetty. Since the members donated so many of their comfort items to the health department and PVH, the organizations have not required a new batch for awhile, but Fetty assured as soon as these organizations are in need for more, she and her fellow members will get to work. The members also regularly volunteer at the Mason County Animal Shelter and the Mason County Homeless Shelter. Recently, they visited New Haven Elementary for their Heritage Day showing the students how to make scarves and installed a book exchange case in New Haven. The Avalanche Club meets the third Thursday of each month and each meeting has a designated host. Fetty shared they typically meet for lunch and then go to the location the host has chosen for their meeting. The members discuss the history of their community, do volunteer work for their community, and also delight in some crafting. Anyone is welcome to become a member and those interested can contact Fetty at (304) 882-3911.